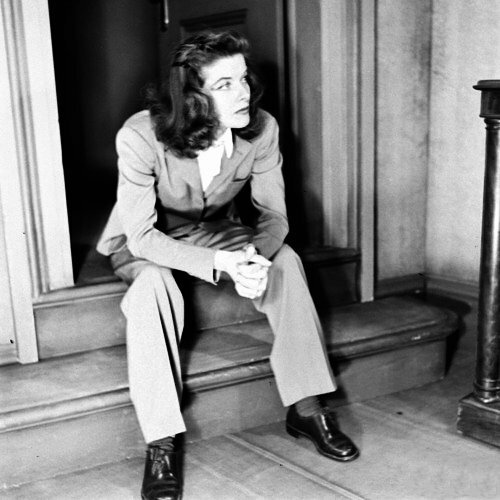 Katharine Hepburn was an early pioneer of androgynous fashion, appearing on set dressed in high-waisted pants and button-down shirts. And now a new exhibition, which opened in New York today, pays homage to Katharine Hepburn’ chic sense of style, which was decidedly unconventional in the Thirties and Forties, when feminine dresses were the order of the day. Curators say one of the first things visitors to the Katharine Hepburn: Dressed for Stage and Screen exhibit will note, is how slender the American star was, as she had just a 20-inch waist. The display, at the New York Public Library for the Performing Arts, featuring forty items of Katharine Hepburn’s clothing, will run through to January 12. Katharine Hepburn, who died in 2003 at age 96, saved almost all the costumes from her long career that included four Oscars and such memorable films as The Philadelphia Story, The African Queen, Guess Who’s Coming to Dinner and On Golden Pond. She also had an impressive personal collection and a grouping of seven khaki pants artfully arranged on a pair of mannequin legs, illustrate her personal sense of style. Jean Druesedow, co-curator of the exhibition and director of the Kent State University Museum, which was given 700 items from Katharine Hepburn’s estate, said: “The fact that she wore slacks and wanted to be comfortable influenced women’s ready-to-wear in the United States. “They understood what would help her characters, what she would feel comfortable wearing… how it would support the story,” Jean Druesedow said. Margaret Furse, an English designer who created Katharine Hepburn’s wardrobes for The Lion in Winter, A Delicate Balance and Love Among the Ruins, went shopping with the star and talked extensively about what kinds of things would set the scene. Among the highlights is a stunning satin and lace wedding gown created by Howard Greer for her role as Stella Surrege in The Lake. The 1933 production was her first major Broadway role and also a huge flop. Writer and wit Dorothy Parker described her performance as running “the gamut of emotion from A to B”. The experience taught Katharine Hepburn to have a bigger say in what roles she accepted, said Barbara Cohen-Stratyner, curator of exhibitions at the New York Public Library for the Performing Arts. When she really liked a costume she had copies made for herself, sometimes in a different color or fabric. A silk dress and coat by Norman Hartnell from Suddenly, Last Summer and a green raw silk jumpsuit by Valentina from The Philadelphia Story were among the pieces she had copied. Comfort was paramount to Katharine Hepburn – being able to throw her leg over a chair or sit on the floor. She always wore her uniform – khakis and a shirt – to rehearsals and pant ensembles to publicity appearances. A companion book, Katharine Hepburn: Rebel Chic, describes how RKO executives hid Hepburn’s trousers in an effort to persuade her to abandon them. “Her response was to threaten to walk around the lot naked. Though she only stripped down as far as her silk underwear before stepping out of her dressing room, she made her point – and she got her trousers back,” fashion writer Nancy MacDonell wrote in an essay for the book. But comfort didn’t mean sacrificing style – and she certainly knew how to be glamorous especially when a role called for it. In her private life, Katharine Hepburn shopped at the major cutting-edge New York couturiers and worked with the best costume shops of the period, including Muriel King and Valentina, said Barbara Cohen-Stratyner. “She really appreciated good fabric and good construction,” she said. The exhibition is supplemented by film clips, movie posters, and archival photographs of Katharine Hepburn wearing the very costumes worn by the mannequins. Her false eyelashes, makeup trays and sensible shoes are also on display.